We are at a digital crossroad with emerging technology outpacing traditional models of success. Your workplace, industry and role will continue to change as technology evolves. You need to take the time to think ahead and evolve too so you can take on the future and change the world. You need a network of support and a firm understanding of what you can bring to the future. 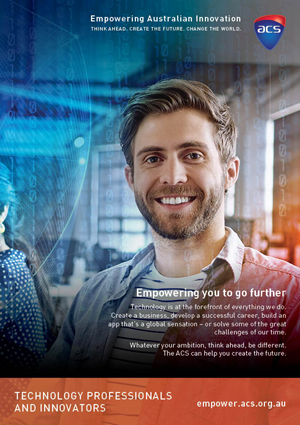 As the Professional Association for Australia’s ICT sector we’re here to help at any stage of your career. So try ACS. You’ll be glad you did. Future graduates will shape our future and change the world by applying technology in new ways. By building a foundation in STEM skills you can exploit new technologies to realise your dreams. Catching the next big wave in your career requires planning. It's not enough to merely master the skills of today. You need a network of support and a firm understanding of what you can bring to the future. Your know-how and capability places you at a distinct advantage to your younger peers. 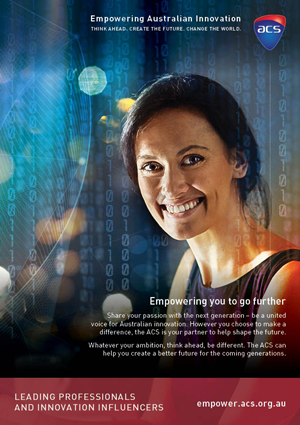 With ACS you can apply your skills and share your wisdom with mentoring and speaking opportunities. 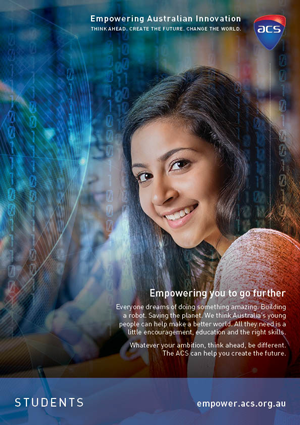 Download these brochures to learn about the benefits for students, technology and leading professionals in joining ACS.